So, let’s all be honest and say that feet creep some people out. And a runner’s feet can be pretty creepy. We lose toenails (knock on wood, I’ve never lost one yet), we suffer blisters, we get farmer’s tans. My feet are certainly not my best feature, but they are the part of me that hits the ground and I need them to be in fine working order. I suffer from bunions and recently had the joy of my mother saying “Your feet look just like your great-grandmother’s!” Not the compliment I was hoping for, but further proof that my gene pool is working against me on this front. So, here are my feet. Maybe your running feet look similar, maybe your big toe is pointing in the not-right direction, too. But who cares? 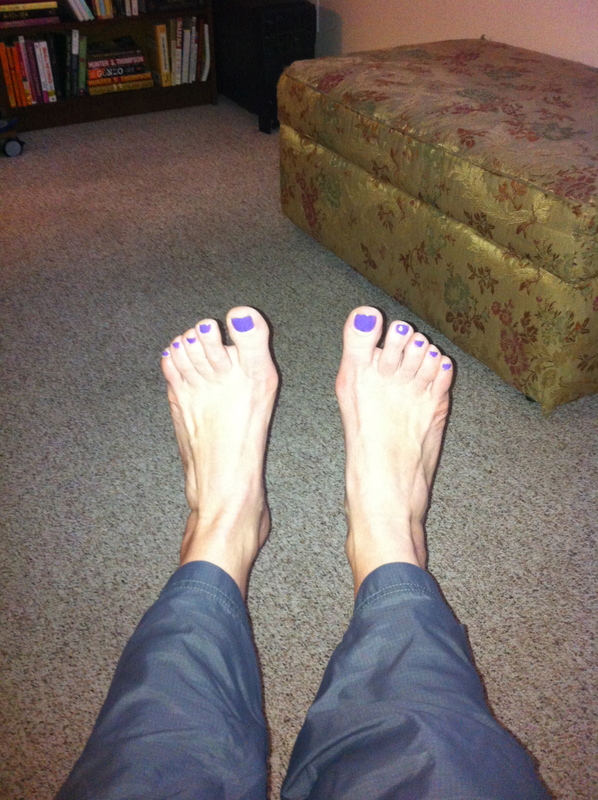 Slap some hot purple (blue, red, green, orange) polish on those toes and be happy with them! Off my soapbox and on to the point of this post. My long-awaited (OK, less than two weeks of waiting) podiatry visit happened today and I’m thrilled to report that I got some good news. First, a quick recap of my injury or what I like to call my “bump in the road.” I’ve been having problems with my right big toe. By problems, I mean pain that aches in the joint near where my toe joins the foot. At its worst, I was convinced that this pain meant my toe was broken or that I had a stress fracture in one of the bazillion bones in my foot. X-rays confirmed that there was no break, and the pain did improve slightly with rest and lots of Aleve. But, it was still there and got worse when I did activities that required bending it (i.e. lunges, some yoga). I took some preventative measures to improve my running while I waited to see the doctor and anxiously headed to my appointment today. I decided to visit Dr. Glady deLeon at the recommendation of the sports medicine doctor I saw when I injured my IT band. It also turned out that a former co-worker and old friend was now one of her medical assistants, which helped ease some of my anxiety about visiting the office. When Dr. deLeon walked in to the exam room and started talking to me about my pain and my feet, I felt an overwhelming sense of relief. She is a runner herself and has marathon experience. She was friendly and kind and didn’t gasp in horror at my feet. Instead, she described that my bunions were the culprit, as suspected, and that the inflammation around them was causing the pain I was experiencing. She confirmed that I was doing everything I could on my own to manage the bunions and that it was time to treat the swelling in order to relieve the pain. Never once did she say anything negative-never said “Oh, you runners!” like the emergency room doctor. Never said “Runners destroy their feet!” like the radiology tech in the ER. In fact, Dr. deLeon said the words I had been dreaming of: “We are going to do everything we can to get you through this race.” I wanted to cry and hug her, but that seemed a little socially inappropriate, so I grinned and listened as she described my options. So, here’s the plan: first, oral steroids to attack the swelling. If those don’t do enough, I may need to head back for injections. And, some day soon, I will have to contemplate surgery to get permanent relief and get my toes back in alignment. I’ll face the surgery when the time comes, but for the next 60 days I’m just facing the finish line and hoping to cross it. I’m thrilled to be clearing this obstacle out of the way and to be able to run knowing that I have a plan in place to deal with any pain. I’m grateful for Dr. deLeon’s help-so much so that I did hug her before I left the office! Happy running all. Here’s to loving our feet, just as they are! So glad that Mandy was there to relieve your anxiety. Glad is the best! She gave me the diaper changing table we use for Aurora. She’s an awesome doctor with so much positive energy. You couldn’t have picked a better foot doctor. Hope your feet start feeling better soon! I have fractured my foot and it keeps creeping back on me. Injuries are no fun! Hi Jess! It was so nice meeting you on Tuesday and so sweet of you to write about me in your blog. I am truly honored to be part of your journey. Thanks Dr. deLeon! I’m so happy to have met you. Years ago I attended a running clinic put on by Lake Health and you were a speaker. I had never even dreamed of running a marathon, but I remember you telling the crowd to train appropriately……and to remember that Phieidippides died after he delivered his message! 🙂 I am so grateful for your advice and for your support! I’m sure I’ll see you again-hopefully not before the race! I’m so glad that nothing super serious is wrong! I got a good chuckle out of the start of this post. Over the winter, I wore a pair of shoes that were two sizes too small when my MIL asked me to do some yard work for her and I had to borrow my BIL’s shoes because I didn’t want to ruin my running shoes. I thought that doing this hurt my big toes and caused what I thought was bruising under my nails that showed up a few weeks later. Unfortunately, that’s not how it got there! Fortunately, most of my running-related injuries have cleared up with rest and prudence while training. However, as I see more and more runners come down with serious injuries (one of my seniors who is a track runner came into my class with a boot on this week, which broke my heart because he’s not running in college and it’s his last season) and I increase my distance over time, I know that the day will come when I may need to seek professional help. Based on your glowing review, I’ll definitely keep Dr. DeLeon in mind! Thanks Joe! Love the shoe story. I’ve been so lucky that my injuries have been short-term and that I’ve gotten great medical care to address them. Hope your training continues to go well. Hard to believe that we are less than two months away from race day! Sorry … I’m trying to catch up on my favorite blogs today so I’m a little behind. First of all, I’m glad it wasn’t anything too serious! I’m also glad your Dr was so supportive of your running! I’ve recently had more positive experiences with Drs when it comes to running. I used to have ones that would tell me that running was bad for me! I just looked for a new doctor! I seriously hope your pain eases up! Recently, I was having major ankle pain, and I realized I was kicking my ankle and didn’t even know it! Anyway, thanks for all your support! You inspire me! Keep up the great work superwoman!